Wild and beautiful Ives treasure as interpreted by John Kirkpatrick, who, in 1939, gave the first public performance of the piece - which had been lying around unplayed since Ives finished it in 1915. Kirkpatrick spent years discussing the sonata with its composer. When asked about sections of Emerson and Hawthorne labeled "(prose)", Ives explained that it meant "not to be evenly played... the tempo is not precise... It is not intended that the metrical relation 2:1 be held too literally." When asked about the countless pencil revisions he'd added to the sonata's privately printed first edition in the years following his first heart attack in 1918, Ives said, "Do whatever seems natural or best to you, though not necessarily the same way each time." As for the variants he improvised every time he sat down to play it, Ives confessed, "I don't know as I ever shall write them out, as it may take away the daily pleasure of... seeing it grow." After Ives' death in 1954, Kirkpatrick became curator of the Charles Ives Archive at Yale, cataloguing thousands of pages of manuscripts, even piecing together fragments of torn pages. He was the first to record the sonata in 1945, returning to Columbia for its stereo debut in 1968. 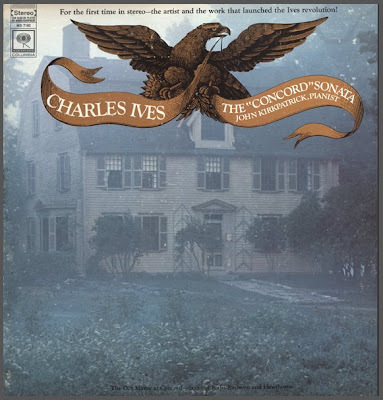 Of the three or four Concord recordings I've heard, this one seems most aligned with Ives' taste for gleeful insubordination, skewing conservatory-trained propriety with the elasticity of Thelonious Monk. Here we find bassist Peter Kowald's large ensemble investigating matters of an Ivesian nature. The first of the two side-long compositions involves the deployment of 15 musicians throughout a recording studio in various configurations playing some loosely organized thematic material, freely improvising and interspersing various canonical material from Sousa to Monk. It's an all-star cast that includes Anthony Braxton, Evan Parker and Peter Brotzmann and they kick up quite a storm from the raging Machine Gun-like opening salvo through some fleet trombone multiphonics (presumably from Albert Mangelsdorff) to a subdued gasp of an ending. For the second piece, Kowald opted to literally take it to the streets and apparently invited every musician in Wuppertal (as well as a number of non-musicians) to participate. 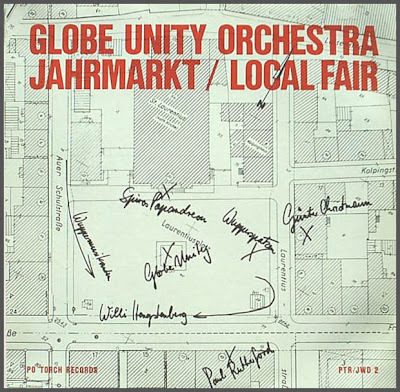 So in addition to the regular Globe Unity personnel, we have a 17-piece brass band, a Greek bouzouki quartet and Wupperspatzen - a 30-piece accordion ensemble. Chaos ensues. Performed and recorded in the town square, one has the dizzying impression of wandering through a space where the local bureaucracy made a horrible error and no one wants to budge. So you have a schmaltzy brass band butting heads with free jazzers while sidestepping the advancing accordion army and trying to ignore that raucous Greek clarinet player. Loads of fun in the best tradition of free music wackiness. The story of the Syliphone label is a remarkable tale of music in an era of African independence and anti-imperialism. Since its independence from France in 1958, Guinea's artists were radicalised by an official cultural policy which sought to modernise the arts while still being faithful to traditional roots. It was a policy called authenticité, and music was its prime focus. Under the policy, each region in Guinea, some 34 in total, were represented by artistic troupes. These consisted of an orchestra, a traditional music ensemble, a choir and a theatrical group. The government purchased musical instruments for the orchestras and encouraged them to sing about topics such as African nationalism, anti-colonialism and anti-imperialism. These regional orchestras were known as Orchestres Federaux, and together with Guinea's Orchestres Nationaux they were at the vanguard of musical production in Africa during the independence era. The Syliphone label's fame grew from these orchestras and was elevated by the high calibre of the musicians who appeared on the recordings - artists such as Sékou "Diamond Fingers" Diabaté, Demba Camara, Kouyaté Sory Kandia and, from South Africa, Miriam Makeba. Guinea's musicians toured all over the continent as well as to Europe, the United States, Russia, Cuba and South America. The Syliphone label thus captured a moment in African history, when a new nation asserted its voice and placed music at the forefront of its cultural identity. 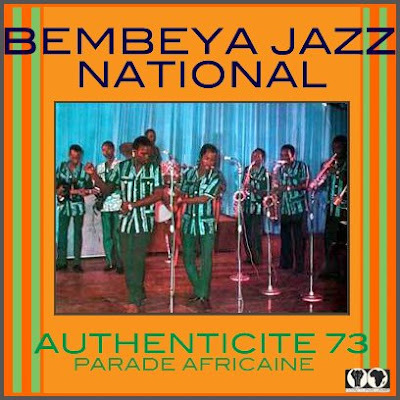 Unfortunately, Authenticite 73 would be lead singer Demba Camara's last stand. Arriving in Dakar for a series of concerts, several members of the group were transported from the airport in a chauffeur-driven car. En route their vehicle was involved in an accident, overturning and seriously injuring Demba Camara. Camara later died from his injuries, plunging Guinea into national mourning. His untimely death had a profound effect on the other members of the band, and for three years Bembeya Jazz neither toured or recorded. But Bembeya did rise again, continuing to evolve into the early eighties, when the death of President Sékou Touré and subsequent military takeover signaled the end of the party for everyone involved. An icon of Guinea's golden age of independence and authenticité.